Last night The Bellevue Downtown Association celebrated our Downtown at the largest Annual Celebration in its 45-year history. 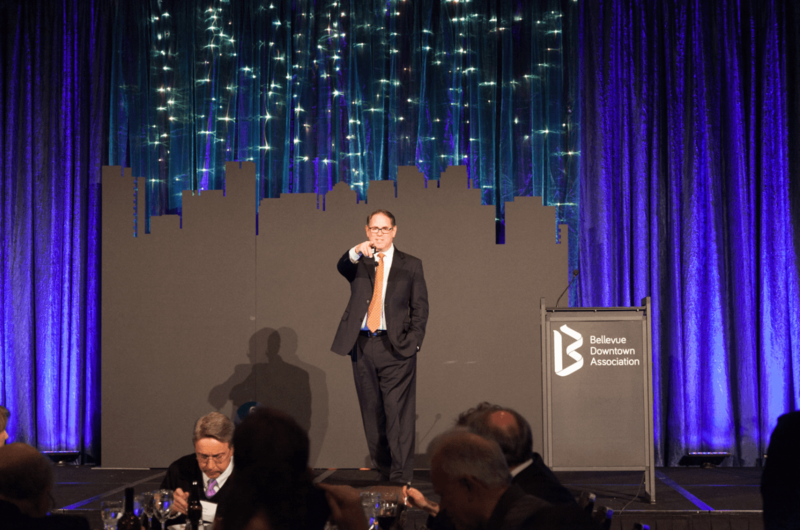 More than 500 local leaders gathered at Meydenbauer Center to toast to the year’s achievements and recognize outstanding contributions to the growth and evolution of Downtown Bellevue. Attendee’s networked over social hour, heard from two esteemed keynotes and joined in honoring two award recipients. Read on to learn more about last night’s program. The BDA’s Place Making Awards recognize outstanding contributions to our skyline and our city. They are markers and makers of civic pride. Last year, we recognized the Lincoln Square Expansion and the Completion of the Bellevue Downtown Park. 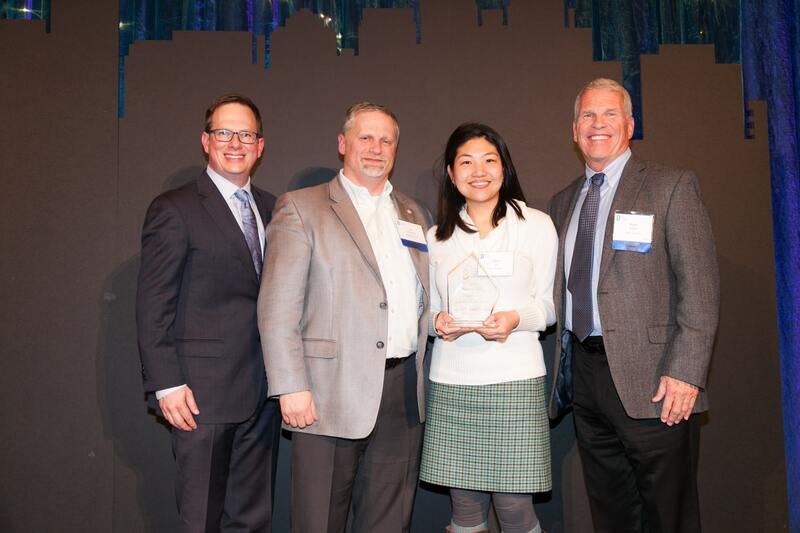 This year, the BDA celebrated John Su and the Su Development team on their “above and beyond” commitment to Downtown Bellevue’s cultural vitality over the last three decades. SOMA Towers is an iconic project with 270 units, graceful facades with a glass skin, and three levels of retail, public plazas and boutique performing arts space called Resonance. Resonance is beautifully designed and flexible. The team continues to program the space with top regional and national artists. It is acoustically suited for world class musicians, intimate enough for a high school student recital, and cool enough for a tech company event. Congratulations to John Su and Su Development and thank you for your contribution to our Downtown’s cultural vitality with SOMA Towers. This John Boespflug City Builder Award honors what every great community is built on – great people. John Boespflug was a talented attorney and highly-involved civic leader. He devoted countless hours to organizations, advancing causes he believed in, like a strong downtown, a well-functioning city and a healthy business community. John served as Bellevue Downtown Association Chair in 1988 and 1999. He was committed throughout his career to working on key issues for our city until his untimely passing in 1999. The BDA founded the John Boespflug City Builder Award to commemorate his work and honor a significant career contribution that has positively shaped the BDA and our city. The BDA recognizes Stacy Graven as this year’s Boespflug City Builder. After 28 years with Meydenbauer Center, 24 as executive director and CEO, Stacy retired this past December after turning the page on Meydenbauer’s 25th celebration. 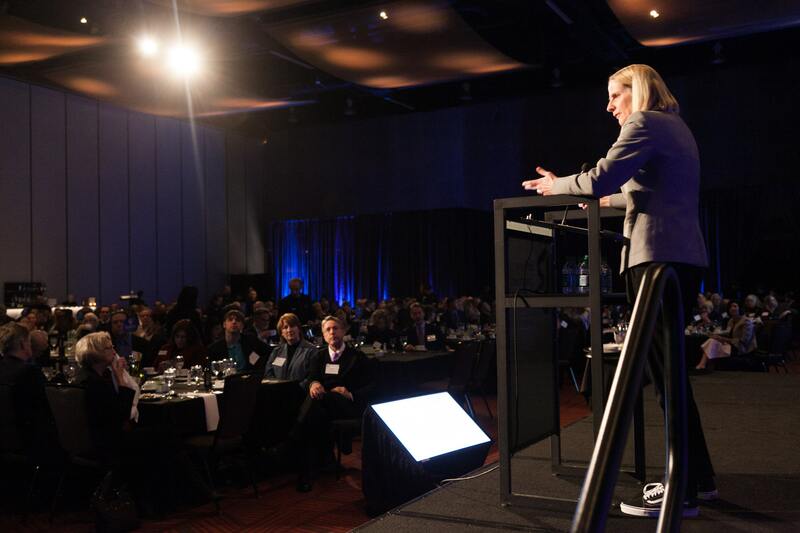 Stacy grew the reach and impact of our community’s convention center, championed two major renovations and spurred the creation of Visit Bellevue Washington, today’s official Destination Marketing Organization for the City of Bellevue. She has played a leading role in the community, notably at KidsQuest and with the BDA – serving on the Board during her entire tenure at Meydenbauer Center. She has been a steadfast supporter of the BDA’s mission and its growth as a respected and effective organization. We are pleased to honor her with the 2019 John Boespflug City Builder Award and thank her for making Downtown shine. Congratulations to Stacy! Margaret Meister is president and CEO of Symetra Financial, a growing national life insurer with roots in the Pacific Northwest. The organization now boasts over 1,000 employees at its Downtown Bellevue headquarters, $43 billion in assets, and two million customers. Margaret joined Symetra in 1988 as an actuarial student and rose through the ranks to become chief actuary in 2004, chief financial officer in 2006, and into her current role as president and CEO in 2018. In 2015 she received the Puget Sound Business Journal’s CFO of the Year Leadership Award and was recently recognized as one of 2018’s Women of Influence. 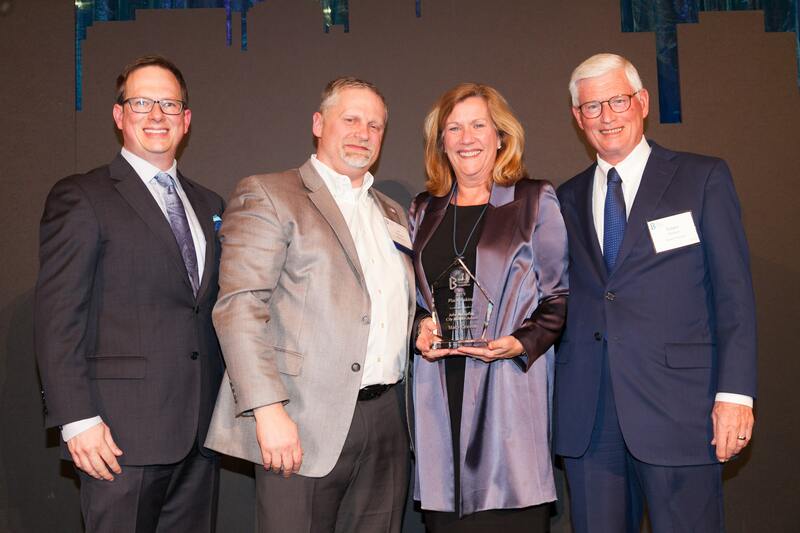 In her address last night, Margaret highlighted the diversity in our region, and the evolving company culture at Symetra, which reflects diversity, equity and inclusion. She also spoke to the importance of being involved in the community and regional issues such as transportation and affordable housing. “Teamwork is the common denominator to move the community forward” she said last night, after acknowledging Microsoft’s significant donation to affordable housing solutions, and highlighting Symetra’s $100,000 donation to The Sophia Way to keep shelters open. Being a progressive workplace goes hand in hand with Margaret’s values of teamwork and partnership, including partnerships with organizations like the BDA and our community events such as the Bellevue Downtown Ice Rink, which Symetra will be sponsoring for the 2019/2020 season. David Downey is president and CEO of the International Downtown Association, a member-powered association which champions livable urban centers and partnerships. He supports organizations worldwide like the BDA with a network, intelligence, tools and strategies for creating strong city centers. The fruits of such partnerships are people-oriented experiences that create memories and empower the public to participate in their community. Achieved through the utilization of industrial design, visual cues, color and space, public places are maximized and activated to create a unique sense of place for their locale and provide for the needs of the community. We look forward to seeing the continued evolution of Downtown Bellevue as an exemplary place. The BDA thanks both of our keynotes for sharing in our celebration and making the evening so memorable. Corporate Sponsors: Amazon, The Bellevue Collection, The Boeing Company, Microsoft, Puget Sound Energy, The Spring District, Sweeney Conrad P.S.